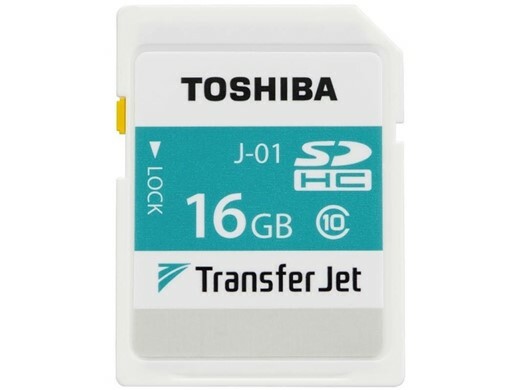 Following some trade show demos, Toshiba is officially�introducing a�new 16GB SDHC card with TransferJet technology. The card, which looks to be available in Japan only first, is able to wirelessly transfer photos and videos from a camera to a TransferJet-compatible device. Sony introduced TransferJet technology in 2008, and�previously included it in an 8GB�Memory Stick card�and Cyber-shot cameras like the DSC-TX7, but it never quite took off in those implementations.�Toshiba’s�TransferJet SD card, rated as Class 10,�is�the first of its kind. It uses very short range wireless communication to transfer content at speeds up to 375Mbps (~47MB/s) to a compatible device, including�the company’s dongles for iOS and Android devices. It’s not quite up to date, but Toshiba’s (delightfully terrible) 2013 TransferJet promotional video is really too good (bad) not to share.